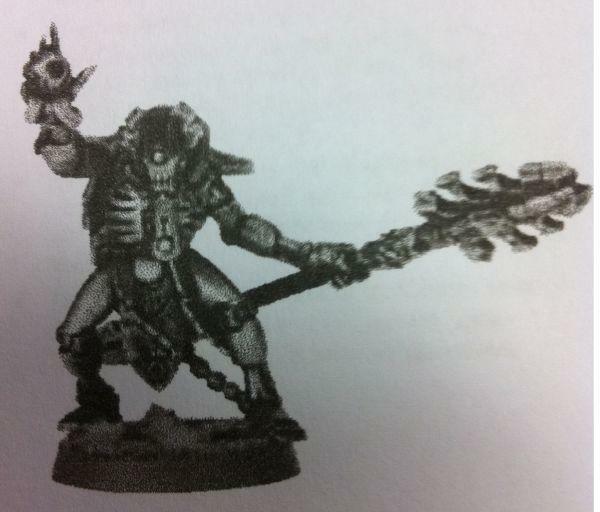 This is the Lord whose mind was damaged during hibernation and he still thinks he's fighting the wars of secession against his fellow Necrontyr (not even realizing he is a Necron now). Therefore, he still practices honor and valor towards his enemies and tries to capture opposing generals instead of kill them. He would also never use Deathmarks, Wraiths, etc, as these are not honorable (assassins). Of course, they also say his subordinates have no such compunctions, so it explains how you can still have these units in an army with him. Even though most of his subordinates would like to see him removed because he's obviously crazy, he is still a military genius and he still has a bunch of loyal followers as well, including his long-standing bodyguard Obyron, who takes care to clean up whatever messes Zahndrekh's delusions get them into (like he always arranges for enemy prisoners to be executed while 'trying to escape' for example). Zahndrekh has the gear to give himself a 2+/3+ save (which generic Overlords can do as well if they take the same gear). He also has a Rez Orb, Particle Caster (pistol) and Void Blade (Rending & Entropic). His special rules are all based around his tactical acumen and they allow him at the start of each Necron turn to pick a friendly unit and give them a special rule: Counter-Attack, Furious Charge, Hit and Run, Acute Senses, Stealth or Tank Hunters (which they get until the start of their next turn). He ALSO gets to pick one enemy unit on the table within his line of sight to lose ALL of those special rules listed above until the start of the next Necron turn. When he is on the battlefield, any number of Necron units in reserve waiting to Deep Strike may choose to enter play immediately after any enemy unit arrives from Reserves. In other words, basically the same ability the Deathmarks have. Vargard Obyron does not take up a HQ slot if in the same army as Zahndrekh. He has an uncharacteristic WS6 (as well as a 2+ save) along with a Warscythe. He also has the Ghostwalk Mantle, which is a Veild of Darkness that can be used to pull his unit out of close combat (leaving the enemy to consolidate immediately), and if he choose to arrive within 6" of Zahndrekh, he does not scatter. Furthermore, if Zahndrekh's unit is ever assaulted and Obyron is not part of that combat, then he immediately teleports into the combat, leaving whatever unit he is in, even if he is already fighting combat or embarked in a vehicle. Finally, he has a special rule that means he keeps track of any misses enemies roll against him in CC (not counting those that are successfully re-rolled). Each 'miss' that occurs before he swings in combat gives him a bonus extra attack that round of combat, up to a maximum of 6. These guys are not cheap (although at least individually still not as expensive as the Stormlord), but they've certainly got some interesting potential. Please take with a pinch of salt as they are still rumours. 0 comments: on "Latest Named Character + Cryptek Pic"